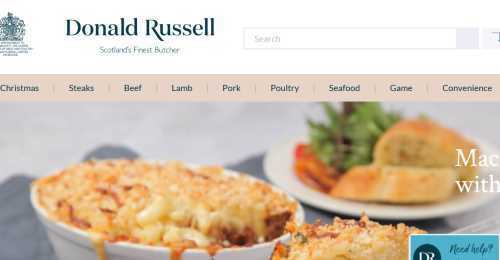 Donald Russell is a royal Warrant holder and Britain's leading mail order meat supplier. Based in Aberdeenshire, Scotland, Donald Russell is a pioneering mail order and online butcher who use only time honoured methods to guarantee the best you'll ever taste. Following customer's requests, Donald Russell has also launched a range of desserts and chef made meals which really bring home the company's mission statement - to provide you with a complete gourmet dining experience in your own home. Free UK mainland delivery on orders of £40 or more at Donald Russell! Verified two days ago. Valid until further notice. Donald Russell discount code not required. Verified today. Valid until further notice. Donald Russell discount code not required. Donald Russell offer history Mar	2016 Apr	2016 Jul	2016 Oct	2016 Jan	2017 Apr	2017 Jul	2017 Oct	2017 Jan	2018 Apr	2018 Jul	2018 Oct	2018 Jan	2019 Apr	2019 Offer Butcher's Special Offers at Donald Russell - Up to 50% off! Sale Offers at Donald Russell - Up to 50% off! Winter Sale Offers at Donald Russell - Discounted prices! Seasonal Offers at Donald Russell - Discounted prices Delivery Free UK mainland delivery on orders over £80 at Donald Russell! Free UK mainland delivery on orders of £40 or more at Donald Russell! Minimum order for free delivery 0 20 40 60 80 £100 £65 Home Brew Online £50 Pong Cheese £50 AGA Cookshop £40 Donald Russell £20 Coffee-Dir.